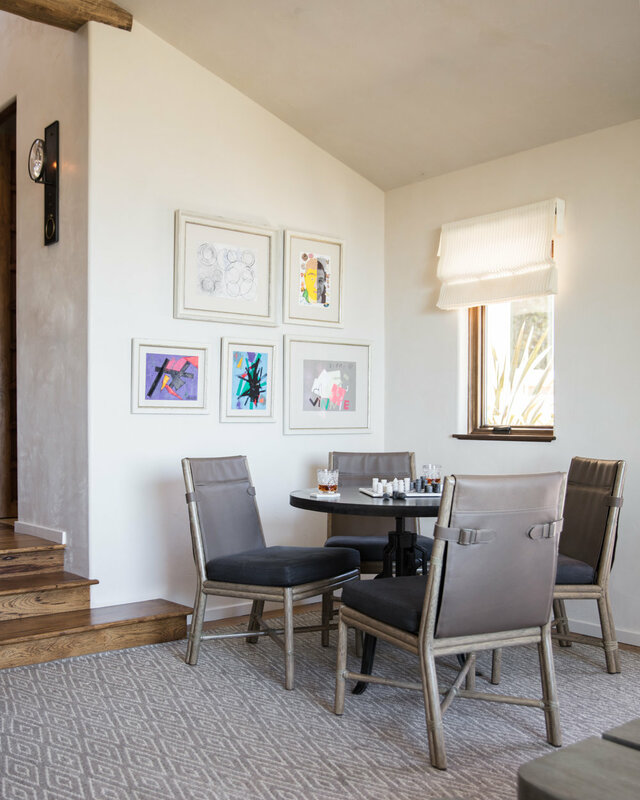 Simply because it would be selfish to keep all the photos to ourselves, we're taking another peek into our Sonoma Ranch House project, looking at the kitchen, family room and bedrooms—which are some of our favorite spaces in the home. Part of the magic of this project was getting to re-imagine the whole space; it was a top-to-bottom redesign and we loved hiding quiet moments, areas of play, and tranquil corners in every room. In our last post, we shared the living, dining, and powder rooms, and that was only the half of it. We have plenty left to share and if the first post has given you any idea, this Sonoma valley house was slowly transformed into a retreat for family and friends to share what our clients now call their home away from home. At the end of a dramatic entry way and right off of the living room is the kitchen—the heart of the home—which didn’t need too much love to bring to life. With a giant window taking up nearly the entire wall above the sink, the space is flooded with a abundance of natural light, making it bright and airy enough to make nightly dishes enjoyable. We added a new custom finished zinc hood to give the kitchen a more bespoke look, and finished off the space by styling it with simple, but functional pieces where everyone could gather. As the gathering place of the home—the playful center—we decided to keep the family room modern and simple for everyone to enjoy. To do so, we used more muted colors to let the surrounding valley views speak for themselves. The light ivory sofa from B&B Italia has a low back to keep the picturesque window wide open and is styled with lots of cushy pillows where everyone can get cozy. In the corner of the room is an industrial style game table paired with unique chairs from McGuire—perfect for playing card games, tackling puzzles, or dueling it out in a game of chess. This incredible art piece, a still life from a favorite artist of ours, Guy Diehl, steals the show in the family room. From the lighting to the details and the subject matter, this piece is impeccably done. We sourced it from the Dolby Chadwick gallery in San Francisco, where you can find Diehl's upcoming exhibition of more amazing still life masterpieces starting on March 1st through the end of the month. Diehl has been painting the still-life subject for 25 years now, and we love how he approaches his paintings with gravitas and a modern sensibility. The level of detail he captures in the lighting and reflective surfaces is incredible—it’s almost hard to believe his pieces aren’t photographs! The bedrooms in this house were all about tone on tone and lots of texture. In the guest room, the walls were covered from floor to ceiling with neutral herringbone grasscloth from Ralph Lauren, which offers both richness and simplicity. Complete with a large wingback headboard, cozy bed linens, and carefully styled side tables from Vanguard Furniture, we transformed the room into a space that will surely make guests want to overstay their welcome—proceed at your own risk! For the master bedroom, we wanted to create the ultimate oasis for the heads of the household. The upholstered king bed, a custom piece from Dmitriy & Co. out of New York City, features lines that are subtle but incredibly sophisticated. The sitting area in this space, fit with blue linen Kalos chairs from MaxAlto, is the perfect spot to read, relax, and enjoy the views out the sliding doors to the balcony. Just when you're thinking that you'd never want to leave the house, the backyard space beckons you outside. 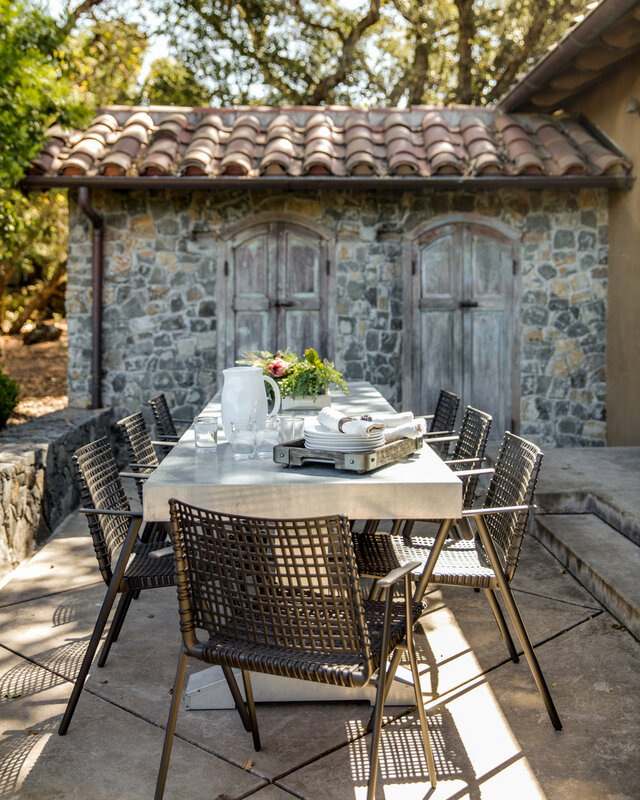 Complete with an outdoor dining area that's perfect for entertaining, the patio becomes the perfect space to enjoy all that Wine Country has to offer. Our client is still working on the guest house by the pool and we're already packing our weekend bags. There's just one thing we're still wondering—who's bringing the wine? Be sure to save your favorites to Pinterest and sign up for the FR Report to stay inspired with ongoing design inspiration from Wine Country. Have questions about your next project? Say hello.